We at Barcelona Golf are delighted to announce that PGA Golf de Catalunya has been chosen as candidate to represent Spain as candidate for the Ryder Cup in 2022.
awarded European Golf Resort of the Year 2015. Caldes de Malavella and the Federación Catalana de Golf, to elaborate the bid dossier for the European Tour Selection Committee before April 30th, 2015. Denis O’Brien, PGA Catalunya Resort proprietor, said, From its inception, the Stadium Course was designed and built with the intention to one day host The Ryder Cup. Barcelona and Girona are connected by a high speed rail line, transporting passengers between the two cities in just 37 minutes. British golfers in the European Team, and from then, continental European golfers were included in the team. Since then, nine edition of The Ryder Cup have been played in United States, five in England, one in Ireland, Wales, Scotland and another one in Spain (Valderrama 1997). Next Ryder Cup will take place in Hazeltine National Golf Club (Chaska, Minnesota, USA), 2016; Le Golf National (París, Francia), 2018; Whistling Straits (Kohler, Wisconsin, USA), 2020. Six nations remain in the running to host The 2022 Ryder Cup Ryder Cup Europe can announce that six nations have formally confirmed their intention to submit a Bid for The 2022 Ryder Cup. From the list of seven nations who initially expressed an interest in hosting what will be the 44th staging of the biennial contest between Europe and the United States, Denmark has advised of its intention not to proceed with a formal Bid leaving Austria, Germany, Italy, Portugal, Spain and Turkey still in the running. Turkey’s formal notification to bid was accepted by Ryder Cup officials and supersedes their earlier decision to withdraw. Ryder Cup Director Richard Hills, said: “The Ryder Cup bidding process has a number of important milestones and we very much look forward to working with the six bidding nations, their representatives, and their national golf federations, in developing the specifics of their respective 2022 bids. Having already taken delivery of an official information pack, the six bidding nations will prepare to host a series of meetings and inspection visits by Ryder Cup Europe officials between now and Thursday April 30, 2015, which is the date that formal submission of official bids need to be made. Following the series of inspections, a period of detailed analysis of each bid by a management team working on behalf of Ryder Cup Europe – together with the assistance of an independent panel of experts – will be undertaken, with the announcement of the successful host country and venue for The 2022 Ryder Cup planned for autumn 2015. 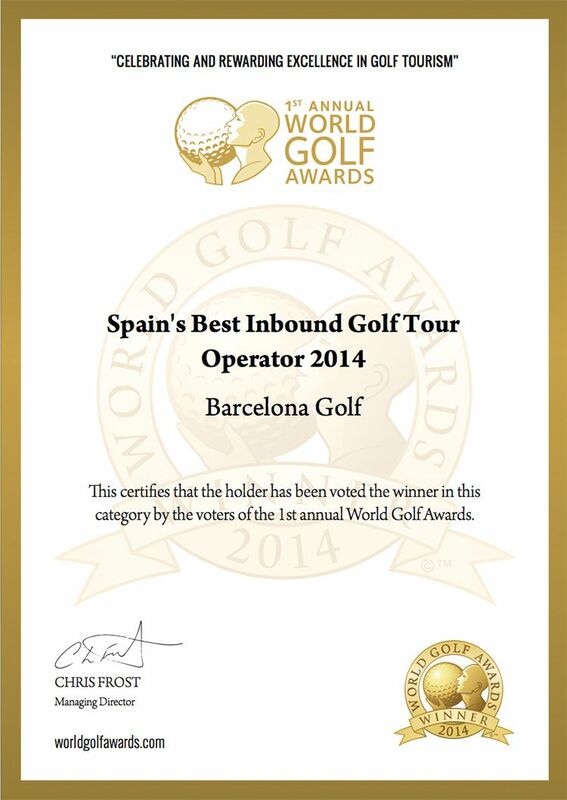 Barcelona Golf Travel has won the award as the Best Golf Tour Operator in Spain at the 2014 World Golf Awards in Portugal. Congratulations also to PGA Catalunya Stadium Course which won the Best Course in Spain Award. The World Golf Awards is part of the World Travel Awards (WTA), which was established in 1993 to acknowledge, reward and celebrate excellence across all sectors of the tourism industry. Today, the WTA brand is recognised globally as the ultimate hallmark of quality, and has been dubbed ‘the Oscars of the travel industry’. “The World Golf Awards has been created in response to a demand from the golf industry for a fair and transparent programme that would celebrate and reward excellence in golf tourism, as well as recognise world-class courses & golf destinations,” explained Chris Frost, Managing Director, World Golf Awards. With an estimated 50 million golf tourists travelling the world to play 32,000 golf courses and resorts worldwide, golf tourism constitutes a vital segment in the global travel and tourism marketplace. The inaugural World Golf Awards will focus on the leading 130 nations that are shaping the future of this dynamic industry.